Epiphytic plant with ascending growth, completely enclosed by imbricating leaf-sheaths. 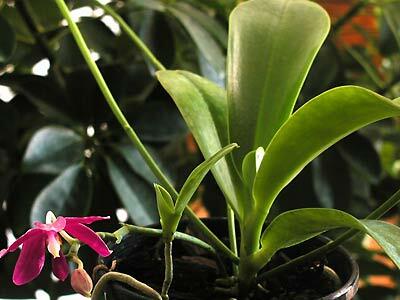 Roots fleshy, may be more rigid than roots of other species of Phalaenopsis, glabrous. Leaves sub-erect, arcuate, oblong-elliptic or almost obovate, fleshy, acute or almost obtuse, of more than 15 cm. long, for 6 cm. wide. Flower stalk erect or arcuate, very much longer than the leaves, bearing few flowers. Flowers fleshy, almost diaphanous, unicoloured, of 4 cm. Sepal dorsal erect, elliptic or oblanceolate-elliptic, acute, slightly canaliculate towards apex, dorsally carinate. Lateral sepal obliquely ovate, acute or almost obtuse, slightly canaliculate towards apex, dorsally carinate. Petals obliquely elliptic or ovate-elliptic, acute or obtuse, cuneate at base. Lip almost as long as the petals, 3-lobed, fleshy. Lateral lobes erect, oblong-linear, with almost truncated apex, presenting a thickening in their middle. Midlobe flabellate, more or less ovate, acute, irregularly denticulate at apex. Disc between lateral lobes presenting a flattened quadrangular thickening. The base of this thickening is drowned by more or less lengthened papillae and protuberances. In front of this papillose zone, two callus bifides superimposed . At junction of midlobe and lateral lobes one distinguishes a slim appendix clearly forked forwards. The mediane line of midlobe is underlined by a very clear keel, frayed before. The disc of midlobe is provided of few developed papillae, and ends in a small thickening at apex. Between this one and the beginning of the hull, one distinguishes some hairs. 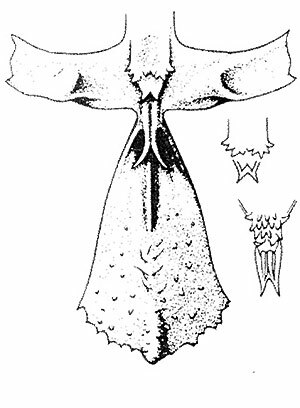 Column fleshy, erect or slightly arcuate, thickened at apex, long from 8 to 13 mm. The color of the segments is uniformly violet/red. Lateral lobes are yellow, the midlobe of the same color than the segments, at white base. Regarded for a long time as a variety of Phalaenopsis lueddemanniana, it is characterized by its estival period of flowering, whereas Phalaenopsis lueddemanniana flowers earlier, in spring. The colouring of the flower is also very different, plain for Phalaenopsis pulchra, it acts of transverse bars for Phalaenopsis lueddemanniana. 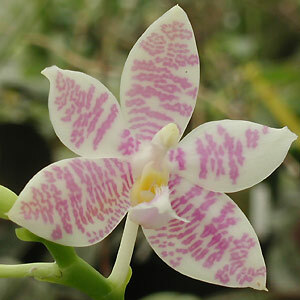 The pigmentation is localised at the ventral face of sepals and petals whereas the dorsal part is white silvery (as at Phalaenopsis lueddemanniana). The comparison of lips watch also some differences, with the result that the separation of the two species is not only one question of surface appearance. 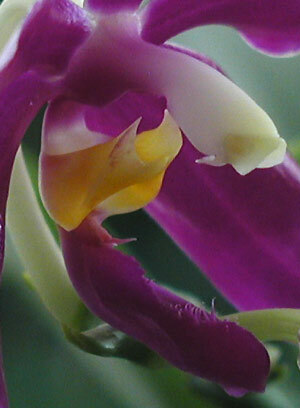 The apex of the midlobe is denticulate at Phalaenopsis pulchra, and even sometimes notched, fringed or fimbriate. At Phalaenopsis lueddemanniana the thickening of the apex of midlobe is more marked, hairier, and this lobe does not have the shape of range, but is linear. By looking at the flower by transparency, one notes a slightly striated or barred appearance, even at the flowers which appear absolutely plain. The papillae of midlobe are not easily observable because confused in the color. The lateral lobes can be marked by trail of purple. The length of the flower stalk varies according to conditions' of growth. It can reach 3 to 4 times the scale of the foliage. 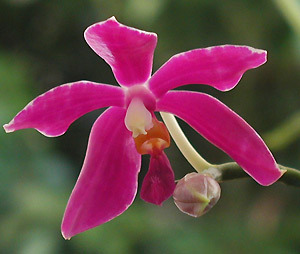 The observation of the midlobe of lip makes possible to avoid confusion with Phalaenopsis speciosa, name under which it is sometimes labelled. In nature this Phalaenopsis is subject to temperatures varying between 11 and 21°c in wet season, and between 14 and 24°c in dry season. It grow at an altitude 1300 meters and more. The rains are continual throughout the year, but the abundance of precipitations varies from 240mm to more than 600 mm In practice, that results in a flowering difficult to obtain when the average temperatures are too high. The plant have then tendency to give stalks ending in keikis, which can make regard this species as difficult in culture. A period in moderate greenhouse avoids this disadvantage. Flowering possible throughout the year, but more frequent in summer. Floral stalks, often very long, easily give keikis which have the characteristic to produce floral stems shorter but more easily floriferous. 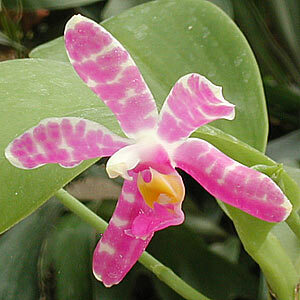 Phalaenopsis pulchra has not been recognized like a species for the recording of hybrids until 2003. Crossed with Phalaenopsis hieroglyphica is at origin of an hybrid known under the name of Phalaenopsis lueddemanniana arlington.